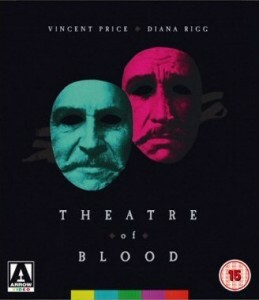 As Vincent Price’s daughter, Victoria, observes during one of several fascinating featurettes on this disc, 1973’s Theatre of Blood neatly bookended the 20-year rollercoaster ride his film career had stepped onto with 1953’s House of Wax. Price’s unique brand of camp malevolence swiftly established him as one of the true giants of horror cinema, arguably the first such since Karloff and Lugosi, and it was never more effectively showcased than in this tour de force collaboration between veteran director Douglas Hickox (co-helmer on 1959’s The Giant Behemoth) and jobbing screenwriter Anthony Greville-Bell (later to gain greater success as a sculptor). But every Faustian pact comes with a bill: association with the genre undoubtedly denied Price many of the classic roles assigned to more mainstream stars, so it is here that Theatre of Blood raises the curtain on the first of its many delights; whilst we never had an opportunity to see Price’s own interpretation of Shylock or Richard III, that tantalising ‘what if?’ scenario is here placed centre-stage, albeit viewed via the crack’d mirror of deranged thespian Edward Lionheart. Yet even here, Price refuses to bypass Lionheart’s shredded humanity and turn him into some species of cookie-cutter killer: “I don’t play monsters,” he once said, “I play men besieged by fate and out for revenge.” The challenge of engaging – and, perhaps more impressive, retaining – the audience’s sympathies for a multiple murderer wreaking vengeance upon those who ridiculed his self-belief is clearly one Price was hungry to sink his teeth into, and with justifiable relish. Nor was dominating the screen going to be an easy task: Theatre of Blood is populated by a quite extraordinary array of British acting talent. As well as Diana Rigg, portraying Lionheart’s bereft daughter (a performance within a performance, as we soon discover), the ‘Critic’s Circle’ now finding itself held square to account comprises Michael Hordern, Jack Hawkins, Arthur Lowe, Coral Browne, Robert Morley, Ian Hendry, Dennis Price, Robert Coote and Harry Andrews, all of whom approach their roles as the film’s alternative villains – assuming you accept Lionheart’s own adjudication – with precisely the right blend of gravitas and doomed pomposity. These are ‘journalists’ versed in such casual malice that even Index on Censorship might not grieve over their bloody demise. It is Hordern’s grisly dispatch – sliced to meaty ribbons in an homage to Shakespeare’s Julius Caesar – which sets out both Lionheart’s modus operandi and the tone for every subsequent execution. Much as Sam Raimi’s Evil Dead would venture eight years later, Hickox and Greville-Bell use humour to distract from what is at its core one of the most inventively violent and gory concoctions to hit British screens that entire decade. Decapitation, electrocution, evisceration, drowning, choking: all are grist to this particularly bloodthirsty mill, yet they remain closer to the tradition of pantomime than the media-manipulated ‘video nasties’ which waited in the wings to overshadow the genre. How appropriate that a drama which evoked the spirit of the Grand Guignol with such flourish should feature ‘theatre’ in its title. Certain contemporary critics – damnable parasites! – apparently regarded this film with a degree of distain, pointing to 1971’s The Abominable Dr. Phibes and its 1972 sequel in what was presumably an attempt to downplay Theatre of Blood’s originality. If so, it was criminally misjudged: yes, Anton Phibes and Edward Lionheart do both practice their own form of homicidal justice, but the former is more of a carnival act, with his insane puzzles and manic machinery of death, whilst the latter seeks vindication as much as vengeance. From Lionheart’s perspective, those whose snide derision poisoned his triumphant grand tour had only to express remorse for their failure to recognise a true genius of the stage, present him with the honours he so richly deserved, and all that other exhausting unpleasantness could have been excised from the text. Instead, it was left to this great Shakespearean impresario to mount this final and most inspired production; the rest is silence. Notes: Rarely would the tag ‘special edition’ be so justified as it is with Arrow’s long-anticipated Blu-ray release. In addition to the crystal-clear transfer (sourced from MGM’s original elements), extras include the 1973 trailer and an rich selection of interviews conducted by film-makers Calum Waddell and Naomi Holwill (as well as Victoria Price, they’ve spoken to her father’s friend and confidante David Del Valle, supporting actress Maddy Smith and composer Michael J Lewis). Sadly, none of the lead contributors are still alive, other than Dame Diana, so the optional audio commentary is provided by all four members of dark comedy troupe the League of Gentlemen; as such, it offers more of a mildly entertaining diversion than any great insight into one of British horror’s most memorable productions, rather like watching the movie whilst sharing your sofa with a pack of particularly hyperactive puppies. That aside, this is a seriously must-have treat for any self-respecting fan of the genre.